From an early stage in the hunt for the killer of Zhen Xing Yang and Xi Zhou, police speculated about their part in an internet football betting scam. Laptop and mobile phone evidence showed almost £250,000 passed through their bank accounts, despite them having a joint income of about £17,000 a year. They were said to recruit people online to send live updates of UK games. Syndicates in China, where matches are televised a minute behind, could take advantage of this and make web bets. During the trial of Guang Hui Cao, Newcastle Crown Court heard how Mr Yang switched money between bank accounts to try to hide its illegitimate origins. The court heard the couple could have been murdered for money made from the betting scam and also selling false qualifications. Paul Gullan, a financial investigator working for Northumbria Police, studied the couple's bank activity and said Mr Yang used "layering" as a way to hide the origin of his money. This means transferring cash which is deposited in one account into another account. Sums deposited into his accounts were often for round figures of £500, £1,000 or even £5,000 at a time, the jury heard. 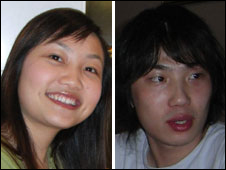 From 2002 until his murder last year, Mr Yang had declared earnings of just £2,771, tax records showed. Miss Zhou earned £14,000 a year as a waitress at the Wagamama restaurant in Newcastle, but more than £140,000 passed through her bank accounts, the court heard. Information passed to Northumbria Police included details of adverts placed on UK-based Mandarin-language websites, recruiting people to watch football matches around the world. One read: "It is a very simple job, any student who is interested, please contact Zhen Xing Yang." 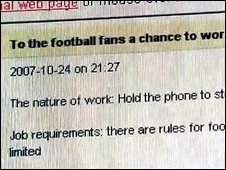 An ad posted under the name CICI-UK, his girlfriend's nickname, on the powerapple website in October 2007, read: "Work: Watch football games and send live information to people. "Requirement: Basic understanding of football rules, no professional background needed, advantage if you have a car. "Location: Sheffield, London, Blackpool, Portsmouth, York, Hull and many other places." Similar adverts requested live information from the Mexican League. However, during the trial it emerged the couple received threats from people who apparently had not been paid for their services. One message said: "Give me the money as soon as possible - I will find you." Another read: "You do not even answer the phone, you liar." It also emerged Zhen Xing Yang may have lied about his qualifications and forged documents to enrol on a Masters degree course at Newcastle University. He gained entry to his MA degree course at Newcastle after stating that he had successfully completed an undergraduate degree at Cardiff in 2005. But Cardiff confirmed he left the university without an award.